"R.B. 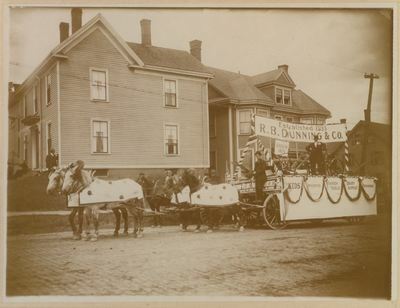 Dunning & Co. Bangor Carnival Parade Float, June 18, 1912"
R.B. Dunning, located at 54, 58, and 62 Broad Street, sold seeds and agricultural equipment. Another location at 37 Mercantile Square (now West Market Square and Pickering Square) sold plumbing supplies. George W. Dunning served as presidient, John G. Dunning served as treasurer, James A. Dunning was secretary, and Herbert A. Dunning worked in "seeds and produce." Bangor Carnival 1912, Bangor Maine history, R.B Dunning Co.